I’ve been playing with some of the new sub grid and chart features in CRM and was able to configure something quite cool, we can now embed a visualisation on the CRM form right next to the data entry fields to provide instant visibility of key data. Very, very cool! I’m going to have fun designing solutions on 2011, that’s for sure! This entry was posted in Uncategorized and tagged 2011, chart, crm, sub grid, user experience on November 4, 2010 by Gareth Tucker. Your first step to simplifying your CRM menu for your users should be to configure security roles that grant READ access to only those entities your users will be working with. Now, this approach only gets you so far. For example you will find you have to give users READ permission to Users and Business Units and as a result the Settings and Administration menus remains visible to them. And you might find you don’t want something like Competitors showing on the menu but you do want users to be able to specify against their Opportunities when they are closing them. I have highlighted in yellow the section of the Sitemap that defines the Competitor menu item. Inside the red box is the privilege check. The addition of this line instructs CRM: “hide the above menu item unless the user is assigned a security role that gives them CREATE permission on the COMPETITOR entity”. So, once you’ve trimmed back security roles have a look at what your users are left with and where you want something visible only to your super users ask yourself “what permission do my super users have that my normal users don’t?” and add the corresponding privilege check. – If Queues are used for Case assignment by team leaders, and your standard user does not have permission to assign Cases then add a privilege check to the Queues menu item based on the ASSIGN permission to the CASE entity. – If you don’t want the SETTINGS menu to appear then you can hide it using this approach but you will need to add the privilege check to each menu item that is appearing under the SETTINGS menu. Consider adding a privilege check to each menu item that references the CREATE permission on the USER entity. This will hide the entire Settings area from everyone except those users who are allowed to create new users. This entry was posted in Uncategorized and tagged 4.0, crm, menu, user experience on March 12, 2010 by Gareth Tucker. CRM ships with Sales, Service and Marketing menus to provide a bit of structure and organisation to the menu. This helps the user experience when your users work across major functional areas and need to be able to work with a wide range of CRM entities. However, if your use of CRM is focussed on a handful of key entities then you might find this menu design a little cumbersome. You might find that you mainly work in Sales but there are somethings you have to go to the Workplace. Jumping between menus can get a bit tiresome and users can get a bit annoyed by not knowing where to look. I’ve found that the user experience can be significantly improved by flattening the CRM menu. In simple terms, you do away with Sales, Service and Markeing and place the menu items that are relevant to your organisation all in the Workplace menu. One menu, all your screens, your users will love it. a. Hint: to comment out XML content you add <!– to start suppressing lines and end the suppression with –>. b. For example: the entire highlighted section below has been commented out. Note the <!— on the first line and the –> on the last line. a. Each menu item is listed in the SiteMap as a SubArea node. · The Workplace menu (perhaps a little confusingly) has Sales, Service and Marketing sub-menus underneath it. · Users’ can choose to have these display in their Workplace or not (via their personal options). · If you want to this option away from your users you can do so by removing the IsProfile=”true” setting. Or, create your own menu groups and place your menu items in those groups. This entry was posted in Uncategorized and tagged 4.0, crm, menu, user experience on March 7, 2010 by Gareth Tucker. 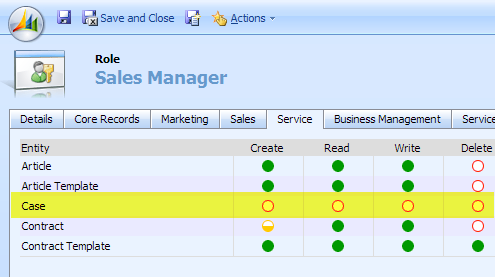 Here’s how to add a menu item in CRM to a specific view – e.g. a “Closed Opportunities” menu item that when clicked takes the user to the Opportunity view has the Closed Opportunities view displayed rather than the default view. 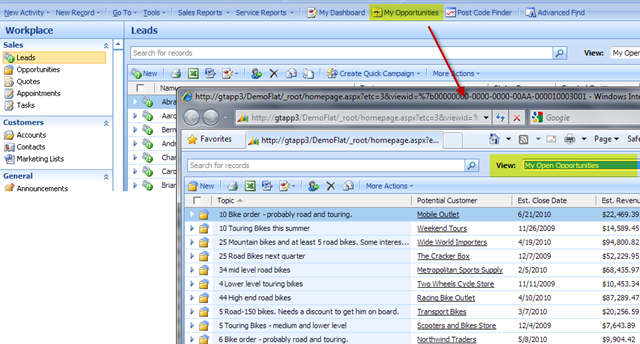 – If we just launched this URL then CRM would open and the default entity view would appear. – We don’t actually need this part of the URL, the Sitemap will add this for us if it is not present and it is better to do this as the sitemap will then be able to deployed to other environments. – If we launch this URL then CRM would open and the entity specified by the ‘etc’ parameter would be displayed. The default view of that entity would be displayed. – This is what we wanted. Now we have a URL that once pinned behind a menu item in the SiteMap will allow our users to have one-click access to a specific view. Now you may have hit an issue back when you tried to copy the shortcut to the view. – CRM does not always let you copy the shortcut of a view, sometimes you will be told “Shortcut for the selected view is not available”. I think you get this on the ‘My’ views – e.g. “My Opportunities”, “My Appointments”. – I’m not sure if you can get around this by having a look in the database and determining the GUID of the view and then building the URL up from that. That might be a solution. – When I hit this limitation, I was able to get around it by making the view I wanted the default view for the entity. I then used a less specific URL, e.g. http://gtapp3/CRMArchitects/_root/homepage.aspx?etc=3 which would just takes the user to the entity’s list view, where my view shows by default. Of course you won’t always be able to solve this limitation this way. – The SubArea ID is something you make up. It must be unique in your sitemap file. – The Title is whatever you want displayed on the navigation menu. 4. That’s it! Now, import your sitemap and then refresh your browser and you should see your new menu item. Once exported you can edit the SiteMap in Notepad, or an XML editor or better still in Visual Studio. But Notepad will do the trick. In my next few blogs I’ll show you how to achieve some of the above customisations.